Sky TV and ultrafast unlimited Wifi, with a wide 52 inch TV. The house is elevated nicely to offer spectacular views across St Clair and out to the Pacific ocean. It is an easy 5 minute stroll down the slight hill to the popular St Clair beach, Salt water pool and esplanade, with numerous cafes, restaurants and bars. 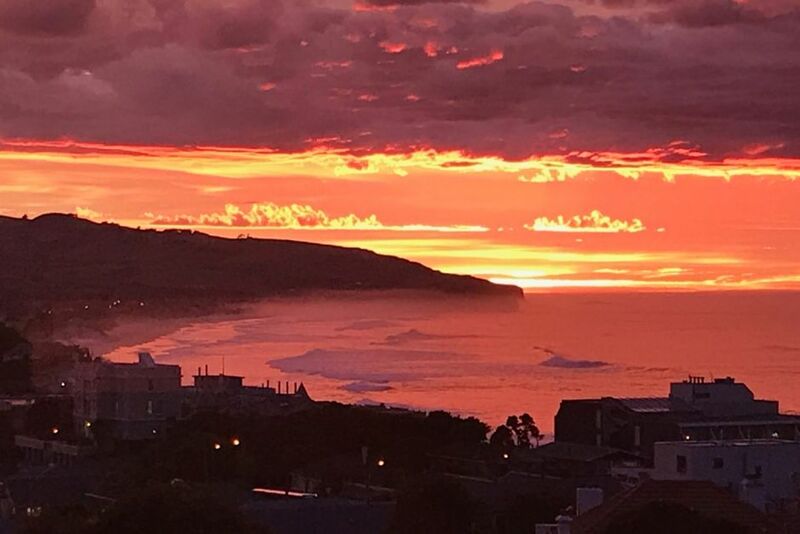 Enjoy watching the surfers and the Pacific ocean, see the weather change, and the moon rise all from the living room or sit in the conservatory and take in the panoramic views from the sea right across to the harbour. Listen to the waves crash at night. Racing fans will also love the birds eye view over Forbury park racecourse or the short stroll down to the meeting itself. Family-friendly, the house is on a flat, fully-fenced section with a trampoline and play equipment. 20% discount for weekly bookings. 25% discount for monthly bookings. The $40 laundry charge will be waived for stays of 3 or more nights. The house is 2 stories so contains interior stairs. Please check if suitable for those with disabilities. A stair guard is provided. Extras: Cleaning (Required, NZ$40.00 per stay); Linen (included). Originally from Christchurch, I've lived in Dunedin for 13 years and love the city. Having returned from my travels in Europe and southeast Asia, I studied tourism at University and have a passion for sharing all that Dunedin has to offer with visitors of many cultures. I live with my wife and two children in a nearby suburb and I'm always available if assistance is needed. This is a large 5-bedroom, 2-bathroom property which is ideal for extended family groups, reunions of friends, and even small sports teams! We pride ourselves on providing a warm, family-friendly "home away from home". Been on the road for a while? Catch up on your laundry, emails, and favourite Sky TV shows. Spacious and private family home. Awesome location with sea views. Short walk to St. Clair beach, restaurants, and outdoor salt water swimming pool (open summer months only). Best bus route in Dunedin for buses to and from Dunedin town centre. 2 Bathrooms, 1 upstairs and 1 downstairs. The beach is only a 4 minute walk down the slight hill. There are numerous bars and cafes to keep you happy on the Esplanade also. The views of the sea and sky change before your eyes. Dolphins have also been spotted. One off-street parking space on a parking deck, and space for parking on the street. Unlimited ultrafast broadband with a Wifi code on arrival. Large table with 8 matching chairs. Extra stackable chairs are available. Salt water pool is a short walk (5 mins). Open in summer months (October to end of March). Could have been a bit cleaner though, although bathrooms and beds where clean. Sorry that it wasn’t up to your standards. However we noticed that you had extra people stay. Evidence left behind that it was more than just ladies staying. Relaxed family setting for my 50th birthday dinner. Perfect for our group stay, nice view out to the beach and sea and very homely living space.